Those who know me, know that I am a lover of great quotes – perhaps I interject them too much, but that’s another story. More than physics, I think that learning as an entire journey is moving from things that we think are impossible to understand or do to making them trivial because we have correctly understood them to the right depth, or practiced to the point of ease. In my work, I find it critical to hold to the mantra “know – do – understand – reflect”. 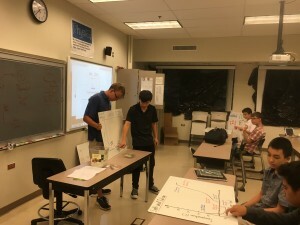 I would argue most of us in our past educational experiences mostly spent most of our time memorizing and practicing lower order thinking algorithms, rarely getting the chance to do something with that information we learned, and even more rarely moving to understanding the core idea underlying the knowledge. To understand something means more than just know it at a different level, it means being able to put it in context of a simplified model, being able to view it from many perspectives, to be able to synthesize, articulate, apply and explain in powerful ways through our expert lens. 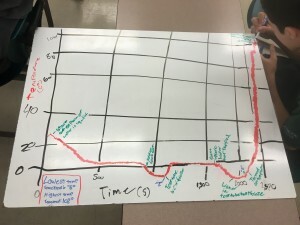 It is my goal when we start investigating any kind of learning objectives that we want to move students to this kind of understanding and to be able to reflect on what that means and how it works for us. So with that in mind, we begin this week with our quarter long project on “Chemistry and Conflict”. 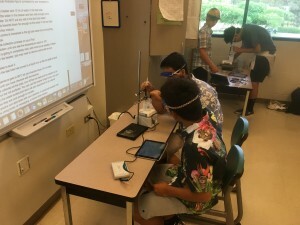 In order to create the need to know, I started the week with a few short demonstrations of phenomena that did not behave the way students expected. In science education we call these discrepant events. The value of the events is really multi-purpose. It elicits attention, as it creates excitement and questions around something that surprises us. It exposes our naïve understanding of some physical phenomena and hopefully asks us gently to consider what were missing from our understanding that would move us to a more expert view. And at some level, it guides our inquiry to try and look at what we can understand better about the natural world. In our next class, we investigated more deeply the phenomena of phase change. 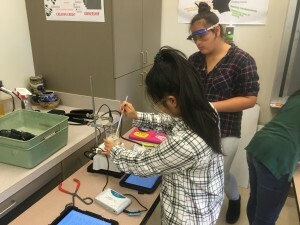 My colleague Gregg had designed a wonderful apparatus in which the students lower the temperature of water down to -5°C, then heat it up until it is boiling. 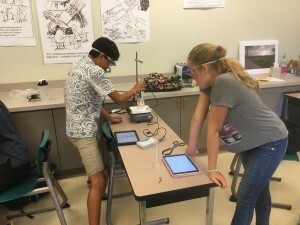 We used our brand-new Lab Quest Streams ( another blog post I should explain the value of using real-time data collection tools to strengthen our scientific research), which enabled us to connect real-time data to our iPads wirelessly – powerful and easy technology. As the students took the data, it became clear that some things behave the way they expected, and then there were surprises in the data. Sometimes liquid water was found to exist under 0°C, sometimes temperature increased while we were cooling, sometimes temperature stayed the same while we were heating. 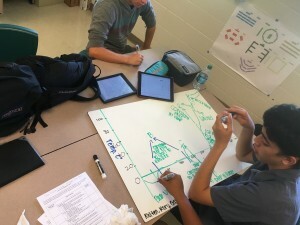 After all this experimental work, we spent most of the next class period analyzing and unpacking what had happened. 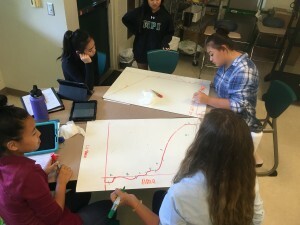 It gave our students a chance to be part of a scientific conversation – practicing the habits of mind scientists do when they look at data, draw inferences, and reach consensus. Over the next six weeks we will continue to investigate the properties of matter that are embedded in our standards: why does the periodic table the look way it does? In what ways does matter interact, combine together, and give off or consume energy? What are the structures of the atom that make it reactive or not? How do we know the model of the atom is an appropriate explanation of the way nature behaves? Lastly, as a part of our work over this project our art teacher Erin is having the students learn a variety of photographic techniques which has its own embedded chemistry in it. 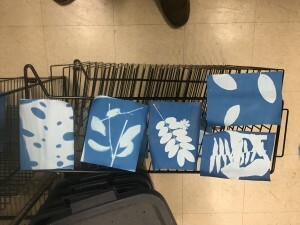 After some initial investigation, and talking about the physical, visual and social aspects of all art, our students started their exploration by creating a set of cyanotype photograms in class. 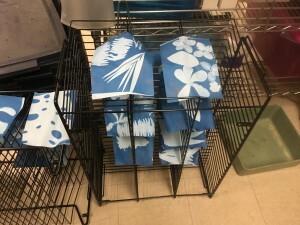 In order to do this, we needed to turn our classroom into a dark room – not an easy task but as you can see from some of the photos below we succeeded! I’m excited to see where we go next with this in the upcoming weeks. I hope you follow along.